The old sniper adage goes “scopes do not enhance your marksmanship, they magnify your errors.” Although a pistol red dot sight (RDS) does not provide magnification, it similarly will amplify your mistakes. 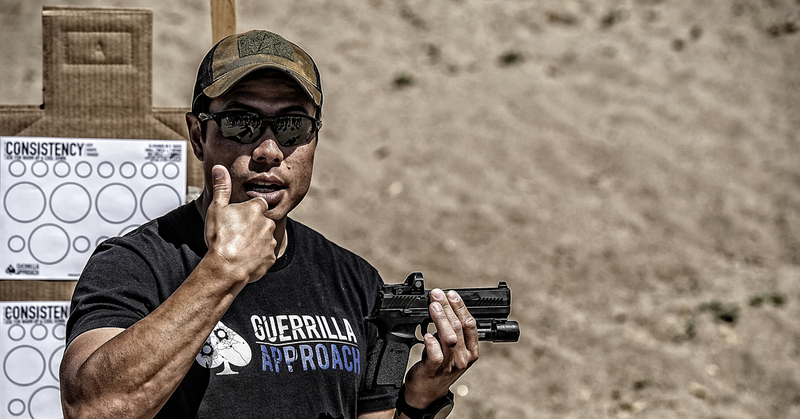 Despite increasing RDS adoption among tactical, competitive, and self-defense shooters, our training approaches have lagged with addressing the added piece of equipment. The fundamentals of marksmanship do not drastically change. However, shooting with a RDS requires a more thorough discussion that extends beyond simply repackaging familiar marksmanship exercises with a preface about a RDS. For example, when shooting a pistol RDS for the first time, tactical shooters commonly state that they “have trouble finding the dot.” This statement should be a huge red flag. Yet, it is routinely dismissed as the shooter being unfamiliar with the new piece of equipment. Trouble with finding “the dot” surfaces for a tactical shooter because he’s conditioned to shoot tactically, not efficiently. Whether turtling his shoulders and craning his neck forward, or exaggerating the extension of his elbows; the tactical shooter struggles because his shooting posture is rigid. Even though these tactical approaches complicate marksmanship, advocates will defend them because they prepare an individual for “the fight.” This line of thinking is a distraction and leads to career long issues with basic marksmanship skills. Unlike his tactical counterpart, competitive shooters less frequently experience trouble with finding the dot. Because competitive shooting penalizes unnecessary body movement, shooters at these events naturally learn to bring their guns to their eyes with efficient motions. However, for the tactical shooter, turtling his neck or exaggerating the lock in his forearms slows him down because he must move more parts of his body in order to acquire sight picture. Furthermore, tactical shooting stances such as turtling force a shooter’s natural point of aim (with just his eyes) to the floor about five feet in front of himself instead of towards the horizon. In order to compensate for this effect, a shooter will then look through the top of his eye sockets to see the target. This is incompatible with shooting a pistol RDS. Instead, a shooter must stand upright so that his eyes natural point of aim is downrange and level with the target. This also allows him to look through the center of his eye sockets and eases the acquirement of sight picture. But doesn’t standing more upright decrease recoil management? Absolutely not. Despite September 10th arguments advocating for bending forward at the waist to absorb recoil, recoil management occurs in the forearms through proper grip. In order to diagnose whether there are issues with your stance, simply perform a reverse draw stroke. Without getting into your normal shooting stance, stand upright with your feet about shoulder width a part. Move your pistol to acquire sight picture. Only your arms should move and it is critical that you present the pistol in a relaxed manner so that you do not default to turtling, flinching, or any other unnecessary “tactical” movement that disrupts acquiring sight picture. Move your pistol to acquire sight picture. Your head should not move and you must bring your RDS to your eyes, not your eyes to your RDS. If you are a tactical shooter that is used to turtling or overextending your forearms, this might feel awkward, but you’re fine. Next, check to make sure you’re not leaning backwards. Your head should rest above your shoulders and your waist. A slight bend forward at the waist is acceptable, however, ensure you’re not forcing the bend. Now, widen your stance for a more athletic posture that is conducive to explosive acceleration out of position (similar to a fighter’s stance). Your stance is correct if your torso and head remain upright and the natural point of aim for your eyes is on the horizon (looking through the center of your eye sockets). During the first look, we focus downrange at the target and then move our pistol into position for sight picture. Next, during pre-sight picture our sights enter our peripheral field of view and we see the top of our slide. It is during this step that shooters will see the top of their RDS window and unintentionally move their heads downward to look through it. The movement is slight, but enough of an adjustment in angles to complicate finding the dot. When shooting with iron sights, an individual is not as tempted to move his head downward at the end of pre-sight picture because iron sights are about a 1/5 the size of a RDS. So where do I look? Keep looking downrange at the target and allow your pistol to move into position for sight picture. Exiting pre-sight picture and into sight picture, the peripheral of your RDS will become clearer. At this point, there are arguments that suggest looking for your irons in order to acquire the red dot. I disagree with this added step and instead recommend that a shooter stay focussed downrange, but aware that his red dot is about to enter his line of sight. At this point, if a shooter has resisted the temptation to bob his head downward or adjust his grip and rotate his pistol to preemptively find the dot, he will achieve sight picture. The arc occurs between shots as the slide resets which causes the red dot to briefly exit and return to your visual line of sight. During a multiple shot string, this produces the arc visual effect in which the red dot visually appears as an arced line. Weak pistol grip prolongs the appearance of the arc because the pistol is taking longer to reset (not mechanically, but instead your hands are physically taking longer to recover and bring your muzzle back level with the ground). In order to minimize the arc or general issues with recoil management, some shooters look to compensators for relief. However, this is unnecessary because applying firm grip to the pistol will remedy issues with reset. So, what does it mean to apply a firmer grip? First, grip is subjective. A shooter’s life experiences may cause him to interpret pressure differently. For example, a golfer thinks of grip differently than an olympic lifter. Second, not everyone has the same size hands. Third, pistol manufacturers do not produce their firearms to fit specifically to your hand and life experiences. For these reasons, grip must be applied through a principles-based approach rather than the traditional procedures-based approach made popular in tactical training. For an in-depth discussion watch “Grip Is Why You’re Missing.” In summary, the video explains that contact and pressure are the two principles of grip, and how you apply them determines your success with follow-up shots. Test whether you’re minimizing the arc though five round strings of fire. I recommend using the Reduced A Box for this diagnostic. At a distance of seven yards, shoot five rounds as quickly as you can. At this distance, accuracy should not be an issue if you are applying proper grip. During the course of fire, pay specific attention to the arc. If properly gripping the gun, its effects will be negligible and barely noticed. However, if you are improperly applying grip the duration of the arc will be extended and possibly cause you to search for the dot. If this occurs, resist the temptation to move your eyes to your sights and instead discipline yourself to always bring your sights to your eyes. A variant of the arc is also observed as a red dot sways into position during a target transition. To observe this effect, place two Reduced A Box targets down range at seven yards and with three yards of separation between them. On the buzzer, shoot the left target with three rounds, then transition to the right target and shoot three rounds. As your pistol sways into position to shoot the second target, you will notice a slightly more horizontal arc prior to pulling the trigger. This can cause a shooter to perceive he has overshot the target with his sights. Therefore, he will move his sights back the opposite direction, but again overshoot. The process of chasing your sight picture occurs in fractions of seconds, but is enough to disrupt an individual’s focus. If you are experiencing an exaggerated horizontal arc as you transition between targets, pay attention to what you visually observe during pre-sight picture and sight picture. You might need to dry-fire the target transition motion until you become comfortable with determining when exactly the dot comes into focus as you exit pre-sight picture; and to what degree of comfort you accept firing rounds as your red dot is slightly arced on the second target. Learning to shoot with a red dot sight is not complicated, but it definitely requires more attention to detail than just repackaging existing marksmanship drills with an added preface about red dots. Dry-fire and shoot the diagnostics described in this article, and pay specific attention to what is happening visually as you shoot. More importantly, slow yourself down if you need to so that you’re not building quick, but sloppy speed. Lastly, do not forget the importance of proper grip. Issues with an exaggerated arc or finding the dot often surface because a shooter is not properly gripping the gun, and not because the sight is ill performing.